The Brazilian Real (Dollar) has not been a stable currency like the American dollar. When you become a missionary you learn all about exchange rates and the banking systems of at least two countries. Like anyone living on a limited income, we try to stretch our money as far at it will go. So exchanging dollars for Brazilian reais is always in the for front of our minds. Unlike the USA dollar that has looked the same for most of my lifetime that is not the case of the Brazilian currency. Here the bills have changed their look, feel and size over the years. The question you always have to ask – is it real? Since we were in Brasilia the capital, we stopped by the central bank. They have a money museum. It show all of their different currency for the past 400 years. Over the past twenty years their currency has crashed twice and they have issued new currency. Their displays featured a number very creative bills that no longer exist. Then there is the display cases of existing bills and the many different formates that they have taken. Then there was the Gold section. Brazil is one of the larger gold producers in the world. In the state we live in they have one of the largest open pit mines that looks like the days of the California gold rush. The have put out a number of gold coins over the years but these are not sought after items. In the culture we live such luxury items are not part of life and because there is so much thievery many people were only fake jewelery. 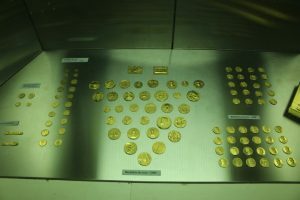 It was great to see all this gold but for most of the common folk gold and money are not dependable.